Saroo Brierley has been on an amazing journey the past 12 months. 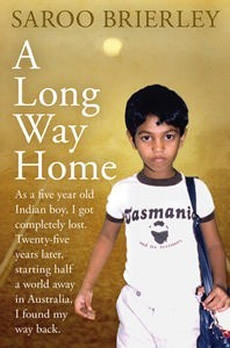 After countless hours writing about his incredible story, we are pleased to announce his book, titled “A Long Way Home” will be released on Monday 24 June, 2013 by Penguin Books Australia. Saroo has also just returned from India, shooting a feature story with 60 Minutes, which includes vision from his home town in Hobart and numerous locations in India. This inspirational piece of television captures the heart-felt perspectives from both his Australian and Indian families and the 26 year journey of tracking down his birth mother against all odds – eventually finding her through Google Earth. Following the release of Saroo’s book on Monday, he will be on a national promotional tour for “A Long Way Home”. Saroo will also be a consultant on the film, which will be produced by Sunstar Entertainment and See Saw Films in 2014.